1. Document your goals and track your results. I prefer to use a planner to track my goals. I outline space for whether or not I am going to work out that day, then create a box to check off to show the result of my intent. Checking a box, or writing a note of accomplishment gives me satisfaction. For me, it’s better than glancing over what I hope to do that day. It gives me room to prove I actually did it! 2. Pack to win. I took the picture above one morning before I left for work. 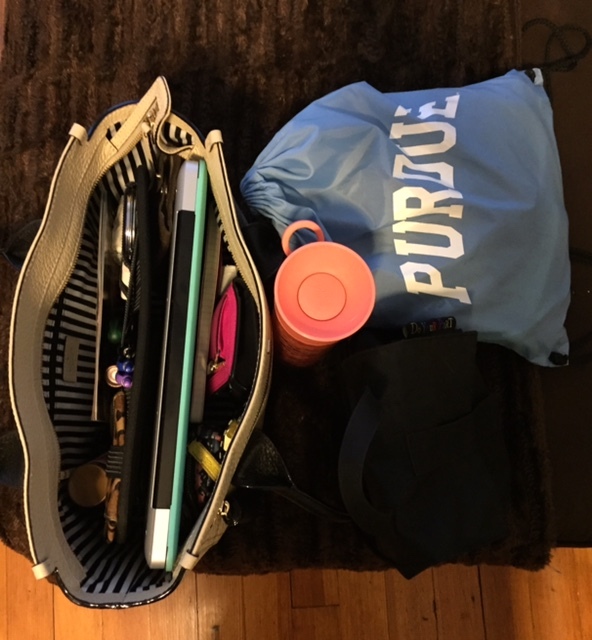 My purse and work tote is on the left, the Purdue bag is my gym bag, the pink circle is the top of my water bottle, and you can barely see the black lunch bag in the bottom right. In order to lose weight I know that I have to eat clean and healthy. Instead of going out, I planned my meals in advance on Sunday then packed my lunches for the week. Last week I even made enough breakfast and dinner items to last 3-4 days as well. Having my gym bag near me makes it easy to say yes to the gym, and my work tote has everything I need to easily get me through the day. 3. Find an accountability partner. One reason working out is going so well for me right now is because a coworker of mine introduced me to a fitness app that has step-by-step instructions on what to do when you’re in the gym. 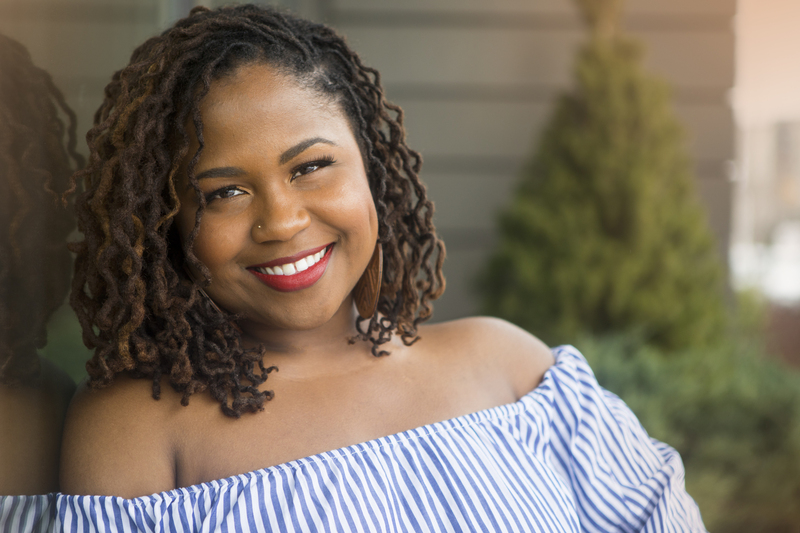 I’m excited to update him on my progress when we cross paths and having someone to bounce ideas off of and model behaviors after really helps me create changes that will leave lasting results. That’s why I offer to be your accountability partner as part of my organizing service. Having a partner you’re committed to working with really matters, whether you’re meeting face to face or not. 4. Stay focused. Okay, this one is a little confusing so ask questions in the comments if it doesn’t make sense. Understand that planning is part of pursuing your goal, but stay focused on the goal. Don’t get caught up in the preparation and end up prolonging the process. For example, before I cooked I decided I wanted to clean everything. That’s fine, but I told myself ONLY wash the dishes, then cook your food. I had plenty of time to do everything else AFTER I reached my goal of prepping food for the week. It’s all about prioritizing. Once you complete your desired task, it’s off your list and you can move on to the next task. But don’t add stuff before you clear what’s already there. 5. Say no. The reason I worked out 4 days instead of 5 days last week was because I let a last minute, unplanned event interrupt my schedule. I didn’t want to say no even though I knew I wasn’t willing to makeup the workout over the weekend. If you’re going to reach your goal you will definitely have to make some sacrifices. In the end, I realized reaching my goal is more important to me than the short term satisfaction of whatever will try to get in my way. I will politely decline and resist, then redirect my thoughts and energy to the task outlined in my planner. At the end of the day I want to check that box of completion and dream up a fun celebration for my reward.